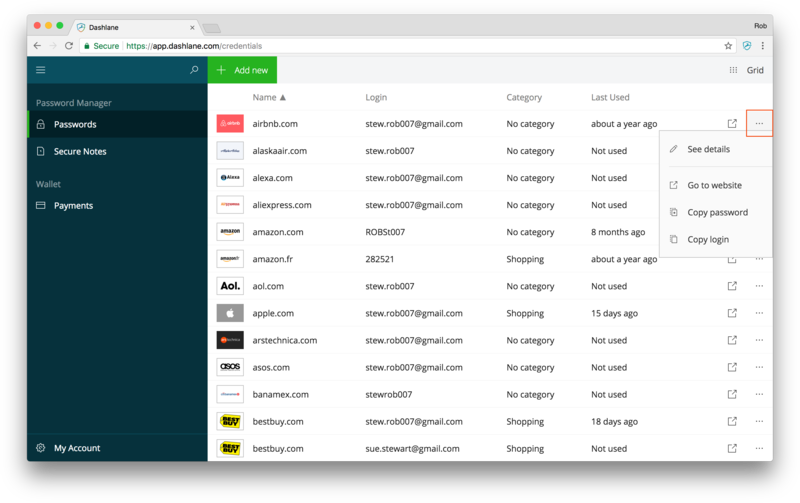 Dashlane Premium and Business users can access their encrypted data stored on our servers* via the web app on any device and browser. On the web app saved data can be added, edited, and deleted, providing a comparable experience to the Dashlane application. Synchronization to our servers must be enabled for your saved data to reflect on the Web app. To access the web app, visit our website and click on "Log in" in the top right corner. You can also go directly to app.dashlane.com. Please note that the Dashlane web app is unavailable on Internet Explorer due to technical limitations. To keep using Dashlane, you may switch to Chrome, Firefox, or Edge. View and edit your saved Passwords, Secure Notes, and credit cards saved within your Wallet. * For Dashlane Business users, also filter your saved data by Space. View your account summary, invoices, billing information, and manage your Dashlane Premium subscription. Manage the list of authorized devices that can access your account and de-authorize any of them at any time. Invite friends from Outlook, Hotmail, Yahoo, or Gmail and/or share your referral link on Facebook and Twitter (a successful sign up will grant both you and your friend 6 months of Dashlane Premium). *The web app does not have the Security Dashboard or features within the Contacts section (the Sharing Center and Emergency feature) implemented currently. Locally saved data or data saved within your Wallet (Personal Info, IDs, and Receipts sections) also cannot be accessed. Payment methods other than credit cards will not be displayed. Please use the application installed on your device to use these features or access this data. Your saved data is organized by section on the left side of the screen. To locate an item, click on the appropriate section or use the search bar located at the top left side. You can edit the details of an item by locating the item and clicking on the 3 dots icon to the right of the item. From there, you will be able to select "See details" to open a password. Hover over a field to see related options, such as “Show”, “Copy”, or “Go to website”. To make edits to the login information or note, click on the associated field, type your change, and click “OK” to save. To do the same for Secure Notes, simply click in the body of the note to edit and click “OK” to save. To cancel or delete an item, locate the appropriate buttons at the bottom of the entry. To add a new Password or Secure Note, click on the green “Add new” button on the main dashboard for each section. You can also go to the website directly, copy the password, and copy the login.